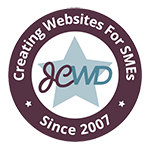 If your business is in need of a boost with a brand new website, or its time to give an existing website a new lease of life - then you've come to the right place! All of my websites are affordable, mobile-friendly and based on WordPress – an a easy to use editing system. A full training session is provided so you can easily change text and images without any technical know-how and each website is created to get the best results and is perfectly suited for your business. Why not get in touch and see how I can help you? A website these days is as important as a phone number. Don’t be left behind! A well designed logo creates professional impact. A must for any new business. There’s not much point in having a website if it can’t be found on Google. I can help. Supported hosting with back ups and upgrades included at no additional costs.